Without the help of machinery, public health brigade volunteers must accomplish their projects by hand. Here, UC Irvine students Eunice Pang (left), Stephanie Vega, Annie Nguyen and Hanna Roh work on a septic hole. Global Brigades is an international network of university students who travel abroad to help communities in need. Each year, hundreds of volunteers visit villages in Ghana, Honduras, Nicaragua and Panama, where they work with locals on health and economic development projects. Since 2007, UC Irvine’s involvement in the nonprofit organization has grown to about 140 active members and six chapters: dental, environmental, medical, microfinance, public health and water. In transforming communities, students such as Nguyen often find themselves transformed. “It’s hard to explain how much Global Brigades changes your life,” she says. A fourth-year biological sciences major, she’s now the organization’s campus chair and hopes to join its staff in the field after graduating next June. For students, traveling with Global Brigades often marks their initial exposure to a developing nation. It’s the first time they’ve seen poverty up close, the first time they’ve met families living in huts with dirt floors and no toilets or running water, the first time they’ve encountered people struggling without the kind of high-quality healthcare they enjoy at home. The experience is also many students’ introduction to heavy labor, such as working alongside residents to lay a concrete floor or dig a hole for a latrine. 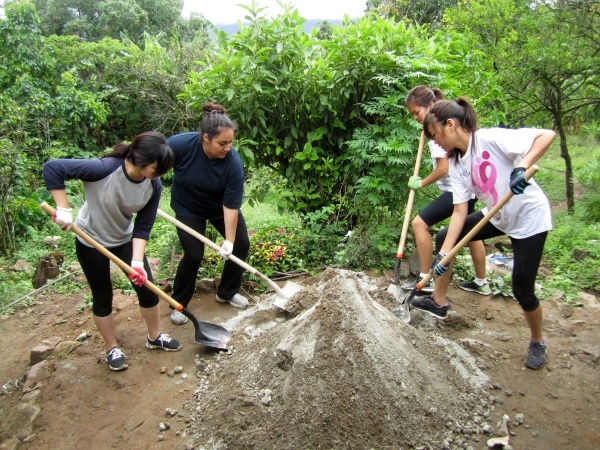 In June, UC Irvine brigade volunteers spent seven to 10 days participating in projects in Honduras and Panama. “I just wanted to do something over the summer that would impact someone’s life, something that would affect a community,” says Ginelle Guckenburg, a third-year public health sciences major and Global Brigades executive board member. She, Nguyen and about 25 other UC Irvine students traveled to El Jute, Honduras, with the public health brigade, which makes home improvements that help prevent common afflictions such as Chagas’ disease, spread by dirt-dwelling insects. They stayed in a Global Brigades compound, sleeping in bunk beds and driving two hours a day over dirt roads to the remote farm village. The students worked with residents on four homes, installing concrete floors, outdoor latrines, shower stalls, water storage units and eco-stoves, which reduce the risk of respiratory illness, common diseases and harmful indoor air pollution. Guckenburg found herself constructing cinder block walls, mixing concrete by hand and hauling it in buckets. About 50 UC Irvine students participated in the medical and dental brigades in Coyolito, Honduras, helping doctors and dentists run free healthcare clinics. They sorted medications, filled prescriptions and assisted with patients. For many students, the best part about Global Brigades is interacting with the indigenous people. They interview them to determine their needs, play with their children and listen to their stories. Jayasekera started UC Irvine’s microfinance brigade in fall 2012 because she wanted to be more involved in locals’ day-to-day lives. “Our goal is to help them escape poverty,” she says. In June, Jayasekera and eight other chapter members traveled to Guaricayan, Honduras, where Global Brigades has established a community-run bank to spur economic growth. The students led workshops on finances and banking and helped residents develop a business plan for a chicken-packing business They went from house to house conducting market research, interviewing people about their poultry-buying habits to make sure there was demand for the product. “We even got to go to a chicken farm,” Jayasekera says. She hopes to become a cardiologist and says that Global Brigades has inspired her to someday work with Doctors Without Borders and start a nonprofit of her own: an orphanage in Sri Lanka. After returning from a Global Brigades trip, students often continue to find ways to help in communities that have few resources; they miss the simpler life, and the camaraderie, they experienced abroad.